La Beotie Pour le Voyage du Jeune Anacharsis. This is an attractive 1787 map of Boeotia, one of the regions in Ancient Greece. Cartographically based on an early map by D'Anville, this map is centered on Thebes and details the ancient region's important towns and cities. The map also attempts to illustrate events associated with the Battle of Plataea. The battle of Plataea occurred in 479 BC and was the last battle in the second Persian invasion of Greece. It took place near the city of Plataea in Boeotia, and was fought by an alliance of the Greek city-states, including Sparta, Athens, Corinth and Megara, against the Persian empire of Xerxes I. The map features Mount Cithaeron, where the tide of the battle turned. The battle concluded with a large portion of the Persian army trapped in their camp where they were slaughtered, essentially brining the invasion to a close. 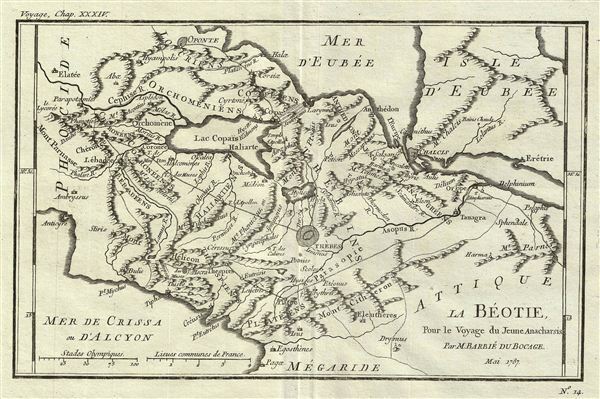 Prepared by M. Barbie de Bocage in 1787 to illustrate the Travels of Anacharsis.